villages of Misty Cliffs and Scarborough. and a walk to the lighthouse itself. Town where we call in at Boulders Beach, home to the penguins. via Llandudno to Cape Town. would then be a distance of 80km or 50 miles approx over undulating terrain. HONEYMOON TOUR - After greeting you at Cape Town Airport we head to your accommodation for your first day in South Africa. Today we cycle back towards Cape Town along the R310 following the False bay coast to your lodgings in Kalk Bay, a rustic pretty harbour where you could stay at Chartfield House www.chartfield.co.za and spend the evening enjoying a meal at the Harbour House restaurant, we would highly recommend. www.harbourhouse.co.za/new/harbourhouse. 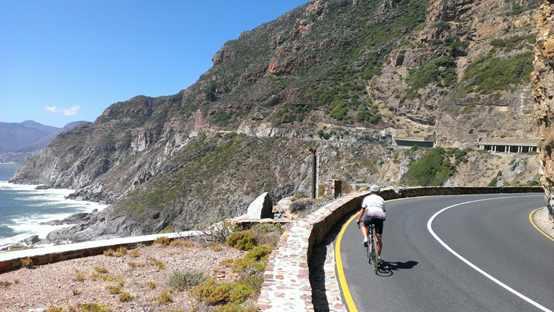 From Kalk Bay we start cycling along the Indian Ocean south to look at a penguin colony in Boulders. We head into Cape Point Nature Reserve to the south western point of Africa. Through Scarborough and Misty Cliffs we find our way back to Cape Town along the Atlantic coast northwards with the famous Chapman’s Peak Drive. 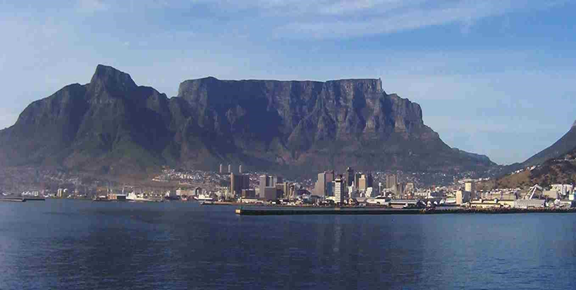 The final day could consist of a guided hike up Table Mountain with the cable car down. What a way to finish! FRANSCHOEK & STELLENBOSCH MTB WINELANDS TOUR 3/4/or 5 Days. Visit the Constantia wine valley or Stellenbosch and Franschhoek with optional cellar tours, wine tastings and lunch at wine farms of your choice. Combine this tour with the popular Peninsula tour to make the most of your time in the area. Pick up from Cape Town and transportation to Elgin / Grabouw where your tour begins. Take the R321 over Viljoens Pass and then off road into Graymead to the edge of Theewaterskloof Dam. After crossing the Draaiberg Bridge follow the R45 through to Franschhoek over the magnificent pass (700m) where you will spend the evening after off roading on the Robertsvlei wine track. This is a distance of around 50 KM. A further day can be spent around this wonderful valley wine and cheese tasting and eating at one of the many superb eateries placed all around on the many side roads to explore. Today you head off road through the Boshendal and Languedoc tracks and then through Ida’s Valley nearer town, which has the Rustenburg Vineyards, after traversing the famous Helshoogte Pass enroute. We cycle through the Jonkersberg Plantation, a circular bike ride right into the mountains. The distance here is around 50 KM. Overnight in Stellenbosch. There is a choice of accommodation which we can discuss you at time of enquiry. Further option of staying in the area for another day to explore the Devon Valley amongst others and even the chance to see a cheetah sanctuary nearby! Head down the R44 taking the Stellenrust track turn off, across Annandale and then joining the R310 back into Fish Hoek along the coast road. Depending on the time of year a chance to see whales, dolphins and seals. Distance here again is around 50 KM. Wine and/or cheese tastings as well as cellar tours can be done on most vineyards simply by turning up on the day. No pre bookings are necessary; the same applies for the restaurants along the route too. You can indulge yourself as much or as little as you like; the choices are endless. Just bear in mind that you need to arrive safely at your accommodations and you are in charge of a bicycle to get you there! Depending on flight times you may have the opportunity to visit Robben Island, home to Nelson Mandela for so many years in Table Bay. Here you can visit the cell he stayed in and have a tour from a previous inmate. Alternatively you can visit the beautiful Waterfront and have a coffee whilst admiring the amazing view of Table Mountain. Heading north takes us from the evergreen coast into the semi arid Klein Karoo. We will arrive in Oudtshoorn, which is known as the ”ostrich capital”, after climbing the Robinson pass(500m) en route. We have a picnic at the top before we descend down and visit Safari Ostrich farm before we take over the ‘Karoo Soul travel lodge’ for the night! This Tudor mansion on more than 4000m² is a piece of magic. It has it all. Day 6 - Easier Day! We are collected from Oudtshoorn and transported via the R62 towards Cape Town along the magnificent Swartberg Mountains - after ± 50 km we reach Calitzdorp, the port wine capital of SA, where we take in a port tasting. Over the Huisrivier pass (655m) and continuing along the World’s longest wine route we lunch at the quaint village of Barrydale at the Dung Beetle Back packers. Over the magnificent Tradouws mountain pass we reach Swellendam, the third oldest town in South Africa named after its founder, Governor Swellengrebel in 1739. Now we head along the N2 over Sir Lowery’s Pass onto the R310 where we disembark and enjoy a lovely cycle along the False Bay coast to Simon’s Town where we stay for the night. PLUS 22mile/35km extension available through Constantia Wine Valley if required. From our lodgings in Simon’s Town we start cycling along the Indian Ocean south to look at a penguin colony in Boulders after the historic Naval Base at Simon’s Town. After a good days cycling, it’s back to where it all began for 2 nights at The Backpack & African Travel centre for a well deserved sleep. The final day consists of a guided city center walk including castle entry then a hike up Table Mountain with the cable car down. What a way to finish! TOUR COMPLETE 560km / 350 miles plus walk and hike above. Well done! !